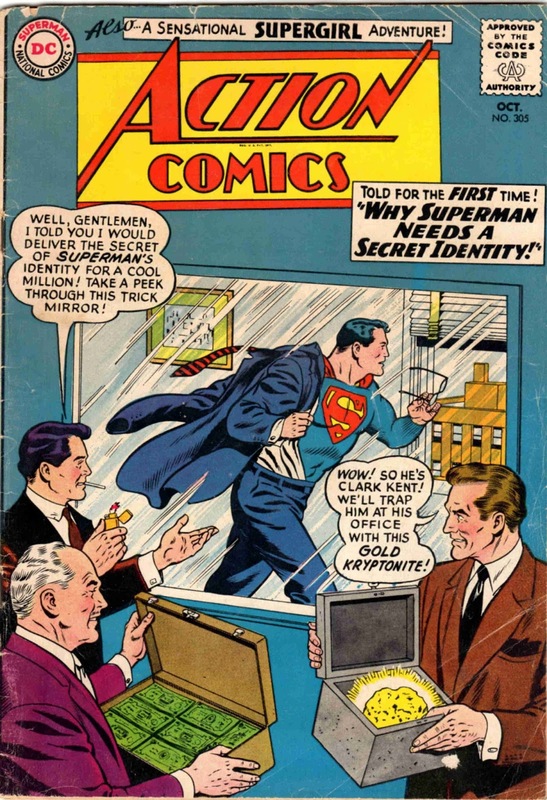 Action #305: That darn Ol' Stockroom Mirror! OCTOBER, 1963: This is the last page of this mini-vignette that ruminates on Superman's need for a Secret Identity. 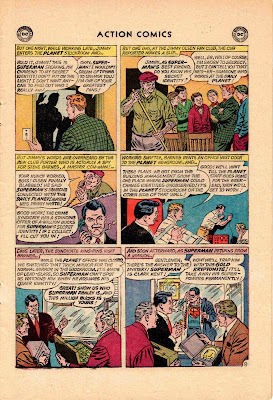 After Jimmy Olsen, meaning no harm, lets it slip to his Fan Club that Superman's civilian identity is one of his acquaintances, a criminal eavesdropper passes the info to a crook, who replaces a convenient Daily Planet stockroom mirror with a special lead-lined one-way glass. 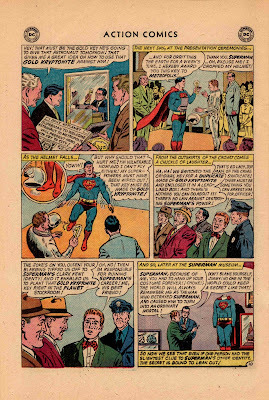 Sure enough, in the scene also captured by this issue's cover, they witness Clark Kent in the act of transforming from Superman. 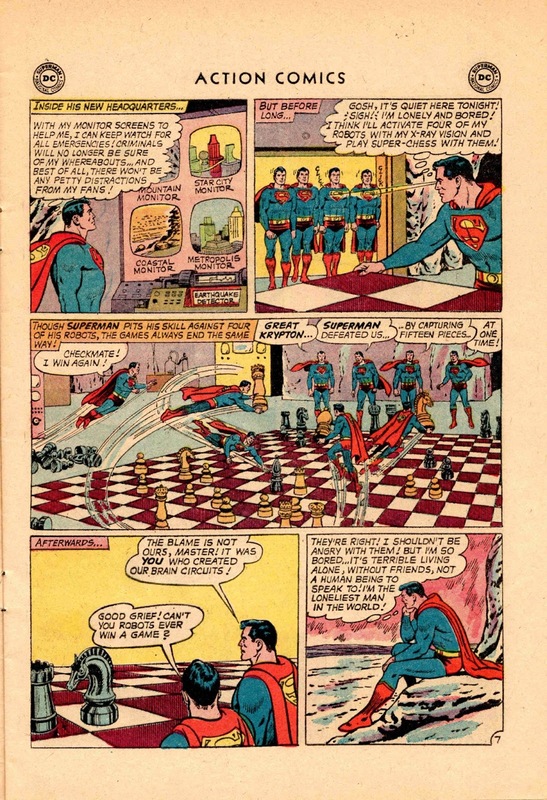 Then, the jerks pull the ol' switcheroo and swap out an honorary key-to-the-city with a duplicate made of Gold Kryptonite. It's a sign of the 1963 era: The astronaut is being honored for CIRCLING THE EARTH FOR A WEEK. In years to come, that would be thin beer. After all, don't those guys in the "International Space station" do the same? The difference is, THEY AREN'T PLANNING TO GO FARTHER ANY MORE. So, Superman is rudely informed that his powers have been stolen. And his poor well-intentioned pal Jimmy is to blame. What a bummer! 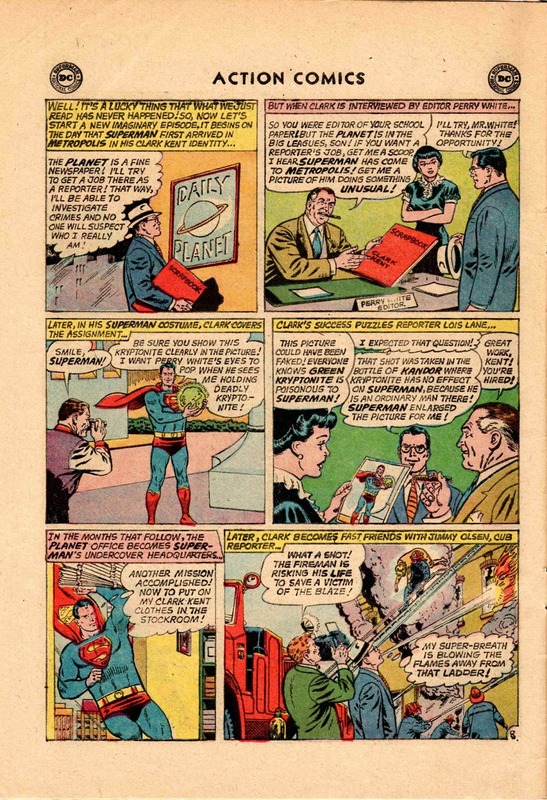 Compare Kal-El's final words on this page with later practice in most comics, regarding a Secret Identity. "No one in the world could keep a secret like that!" A statement more honored in the breach, eh? See you Monday with the continuation of this story. 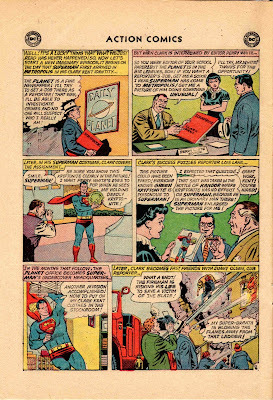 OCTOBER, 1963: In our next vision of what Superman's life might have been like with his Secret Identity in jeopardy, we start over with Clark Kent arriving in Metropolis for the first time, still with an intact super alter-ego. 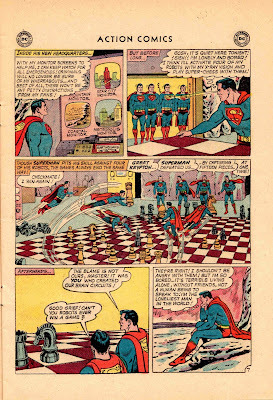 Think of it as an updated take on 1938, Action #1, and the first Superman story. Only with a narrower focus. And no Senator Barrows. And no bouncing a bad guy's car off a cliff. And no .... NEVER MIND, JUST READ. You know, this first panel makes you wonder. Hasn't Superman ever heard of LOCKING THE DOOR? And the remainder of this page's events, while entertaining, remain similarly jarring -- though they make for a GREAT comic-book story. No, it just makes you wonder why the Super-brain of Clark (Superman) Kent doesn't wonder why there's a new window IN AN INTERIOR WALL. Oh -- it's not a window -- Barnes swapped out a "normal mirror." Now we wonder, what newspaper stockroom features a four-by-four-foot mirror. The page's last panel is a condensation of our cover scene. Unlike some other DC tales, this story does not simply shrink down the original cover art -- it's the same scene but re-drawn. 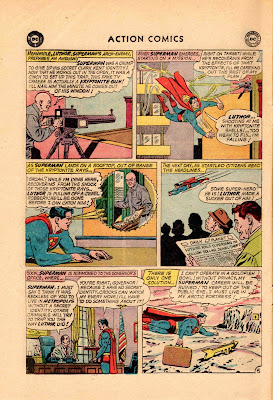 OK, thanks to Jimmy Olsen's desire to associate himself with greatness, we have the stage set for a dreadful outcome. Now that these schmoes know that Superman is Clark Kent, what will happen next? 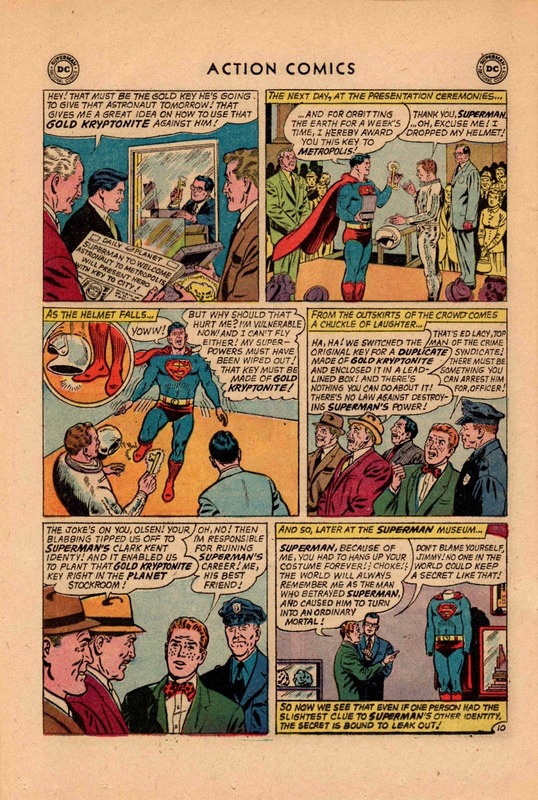 In this Imaginary Tale-within-a-Real-Tale from October 1963, Superman has decided to forego a Secret Identity. In the previous pages of this conjectural timeline, he lost his parents to a vengeful crook. Having moved to Metropolis in the present day, he's constantly pestered by us mortal-types who want a selfie with the Great One. Next thing you know, the President is gently asking Supes to please take his crime-magnet self out of Metropolis. When our good ol' Prez tells you to hit the road, that's serious stuff, campers. Having had very lonely times in my life (haven't you? ), I know what it's like to play hours of solitaire, desperate for a friend or congenial face. You do indeed feel like the loneliest man in the world. Taking the Watchmen allegory a bit farther, what makes Superman different from the social outcasts depicted in the Moore/Gibbons tale? Probably his childhood, raised and socialized by a loving family. He feels a part of the world, not a giant bestriding a planet of ants. That empathy and humility, my friends, are at the core of compassionate heroes. That's truly what we want when we cry "Save me!" Think deeply on our need for rescue, and I'll see you Wednesday with the next few pages from our story.